Some security lines at the airport had been closed for hours, a witness said. ORLANDO, Fla. — A TSA officer who jumped from a hotel balcony at Orlando International Airport and into the atrium area of the hub is dead, police confirm. Orlando police tweeted Saturday morning they are working the active investigation as an apparent suicide. The agency later messaged the officer was taken to an area hospital in critical condition but later died from his injuries. He is identified as a man in his 40s. WKMG-TV reports, citing an airport spokesperson, passengers at gates 70-129 are being re-screened. Arriving flights and departing flights to those gates were delayed. Southwest Airlines earlier tweeted a ground stop had been in place. In a statement, the TSA says an off-duty officer fell from the hotel balcony. Several passengers moved past security afterward, prompting a re-screening of all passengers. "Our thoughts and prayers go out to the officer’s family, friends and everyone in our TSA family," the statement reads, in part. James Shaw said he and his daughter were staying at the Hyatt Regency Orlando hotel for a kids' dance competition. He claims he saw the TSA officer jump from the highest floor between the hotel's two elevators. Shaw, a Safety Harbor, Florida, resident, said the agent jumped from the 10th floor. "At first, I thought it was kind of weird," Shaw said. "You can see the security lines from here, so I figured they had him stationed." Shaw said he got on the elevator and left, only moments later to hear a boom. "That was when he jumped," Shaw said. "People thought it was a bomb or shots fired." 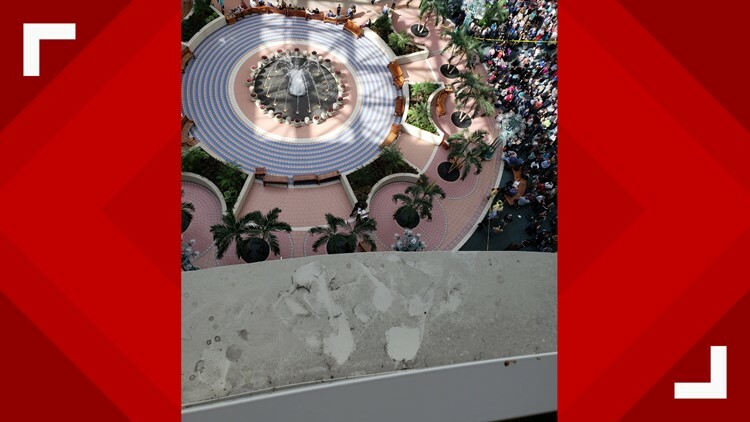 A witness at Orlando International Airport said he saw what appeared to be a TSA agent jump from the 10th floor at the hotel to the atrium below. Shaw's daughter, 6-year-old Naomi, is not aware of what happened, he said. Many other children for the young kids' competition "freaked out" because they had to evacuate the area. Security lines were closed since about 9:15 a.m. but reopened after noon, Shaw said. Passengers for hours were not able to leave, and it appeared people had not gotten off incoming flights, he added. A request for comment from Orlando International Airport had not been returned.